I don't know what it is, but there's something really exciting about being the first person to own a car. Maybe it's because brand new cars come with the latest technologies, extremely low mileage, and that new car smell you just can't duplicate. Plus, there are no animal crackers stuck between the seats from the previous owner's three-year-old. But these aren't the only perks of buying new. Unless you have the misfortune of getting stuck with a lemon, new cars typically have fewer maintenance problems, too. In most cases, you don't have to think about replacing the brakes, tires, or other minor repairs for at least a few years. If you run into some defect, most car manufacturers offer a three-year limited warranty, which provides added peace of mind. Additionally, if you're financing, banks usually offer lower interest rates on newer cars. For example, Toyota sometimes runs a 0% financing promotion (or financing as low as 1.9%) on new models for well-qualified buyers. If money is the least of your worries, it probably doesn't matter whether you buy new or used. But if you identify with the rest of us and you're pinching your pennies, you need a monthly payment that doesn't stretch your budget or cause unnecessary financial strain. The good news is that buying a car doesn't have to complicate your financial life. If you have good credit and you're able to qualify for a new car loan with no hassles, banks may compete for your business and offer the best rate possible. But even with low-rate auto financing on a new purchase, a new car will be more expensive than an older version of the same car. Not only because of the higher sale price — you'll also pay more in other areas. Brand new cars can have higher insurance premiums than used cars. And if you live in a state with personal property taxes, the newer your car, the more you'll pay in taxes each year. It's not fair or right, but new cars depreciate faster than used vehicles. The sad reality is that the average new car can depreciate as much as 19% in its first year — and that's just an average. What does this mean for you? To put it simply, if you buy a brand new car without a down payment, or if your monthly loan payment isn't high enough to compensate for depreciation, you could end up owing more than the vehicle is worth. Let's say you pay $20,000 for a brand new car and $3,000 in finance charges over the length of a five-year term. This brings the total cost of your car to $23,000. We'll factor in a 19% rate of depreciation for the first year, which brings the value of the car down to $16,200. Your payments are $350 a month, or $4,200 a year, so by the end of year one, you'll owe the bank $18,800. Sure, you're making progress on the loan. But since the value of your car dropped nearly $4,000, you now have negative equity and you owe $2,600 more than the car is worth. Negative equity isn't the worst thing to happen if you plan on keeping the car until it's paid off. 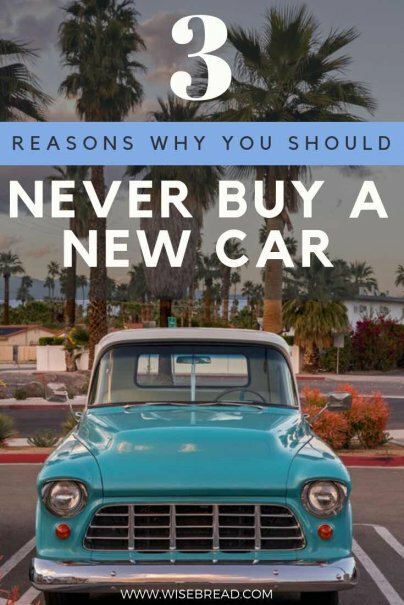 But if you're the type of person who trades in vehicles every two or three years, negative equity can increase the cost of your next vehicle. If the dealership gives you $19,000 for your trade-in, yet you owe $22,000, the $3,000 difference doesn't disappear. Instead, the dealer tacks the negative equity onto your next car loan. So instead of a sale price of $27,000 for your next vehicle, you end up financing $30,000. Since cars depreciate rapidly within the first year, buying used is an opportunity to get more for less. I have a friend who purchased a one-year old Toyota Camry XLE back in 2010. It was a top-of-the-line Camry with wood grain, leather seats, sunroof, rims, heated seats, JBL sound system, dual temperature control, fully loaded. Just one year prior, the car sold for about $28,000 brand new. However, she was able to purchase the vehicle for a little more than $20,000. The car only had 13,000 miles and not a single scratch or stain. It was like buying a brand new car, without the brand new price tag. What do you think? Are you a new car loyalist, or have you found value in buying not-so-new? I'd love to hear you take on this discussion in the comments below. I've actually found I could buy new for about the same price or just a little more than a 1-3 year old vehicle. The two vehicles were a Subaru Outback, and a Ford F150. The Outback was about a $1,000 more than a year old model with 15,000 miles. With new, I got the full warranty, color and interior and a couple of features I wanted. I purchased the 2015 F150 a month ago with factory incentives to move out the 2015 models plus a great Costco discount. I got it equipped to pull a travel trailer for the same price or less than 1-2 year old similar models were going for. I always buy new and I always order my cars direct from the factory with the exact options I want. I use a special discount program negotiated through my former employer which gets me several thousands off the price and no haggling. Well that may be for cars. But what about trucks? I purchased a 2009 Tacoma v6 crew cab long bed approximate $28000 cash. The Dealers offer me 26 for the last 2 to 3 years for that truck as a trade. I know the Tacomas are in high demand they hold their value. My brother in-law bought a 2012 Tacoma 49000 miles same as mine but a TRD for $24000 in 2013. Last car I bought I got for a HUGE discount because it was an end-of-model-year dealer demo with a five-speed manual transmission. I just hit ever dealership up and down the drag and asked them what they had that was, "Fast, flashy, and open." My last vehicle cost less new than a one-year old vehicle of the same make and model with fewer features. It all depends on what you find and where. I purchased a two year old vehicle from the first owner that still left me one year of warranty. I paid 65% of the new price, yet I still got an as-new car. I was actually able to afford a better model than if I had purchased new! Buy a brand new car at the very end of current model year and you'll get up to $10k off in some cases. New car will have lower interest rates and better warranty, which may end up costing less in the end. This is a half-pass article. I usually buy at least 10 years old, and with well over 100k miles. Before looking I research the model to make sure the model is reliable. When I find one I'm interested in, I have a mechanic do a pre-purchase inspection. The price is low enough that I just pay cash. Since there is less value to insure, insurance costs less. On a total cost per mile bases, I pay pennies on the dollar compared to buying new. I totally disagree with every point in this article. When we lease a car with a residual value of more than 55%, a new car is always cheaper than a used car of the long run. I shall be collecting my new car in two weeks. I ordered the top model and added a load of extras like an Electric Panoramic Sun Roof, Park Assist etc, plus the top-spec interior and exterior trim. I added a host of extras, and omitted a few I knew I wouldn't need. Buying used, I would be taking pot luck with these, as well as trusting that all was in good order. Never paid more than 1k for a car. Our current one cost 700 bucks and it's lasted so far 4 years. My boyfriend only had to repair it once himself for 50 bucks by doing his own repair. It still runs and I've never been late to work. If you buy a New Car, You Know the car is Brand New and Under Warranty for at least a few years. Sure you pay a little more but what you get is a Brand New Car with Every Part Brand New. Buying New Makes A Lot More Sense than wasting $$$$$ on Used Junk.